The Nacecare Duplex DP 420 Multisurface cleaning machine is an invaluable piece of equipment. It's versatility makes it unlike anything else on that market. With a 14 inch cleaning path capable of cleaning a variety of surfaces including rubber profiled matting, ceramic, hard surfaces and carpet (it even has an optional escalator cleaning adaption), the DP 420's cleaning option seem almost limitless. Featured on this machine is an 800,000 bristle counter-rotation brush design, water is fed into the brushes via a solution flow trigger, and a powerful vacum recovers the dirty water immediately, or it can be left on the floor for pickup after. DP 420 - 14" path - x1 available - 2 months parts & labor warranty! • DP 340: 11" path. 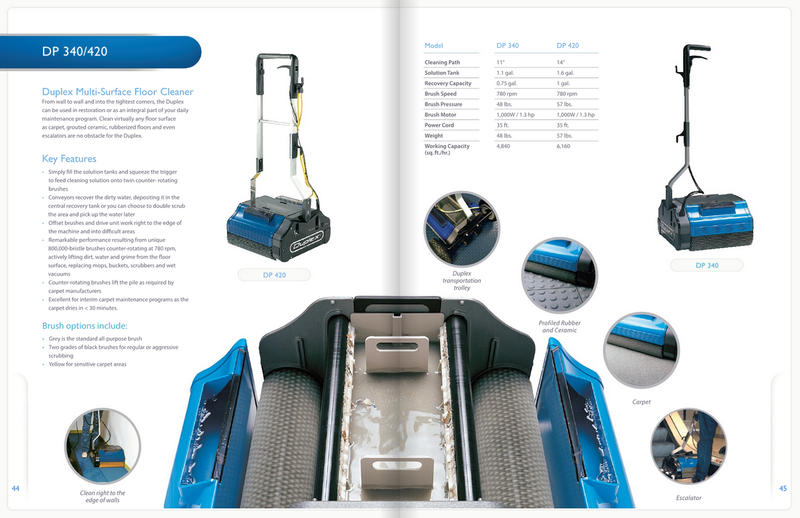 • Escalator cleaning adaption option available! • Cord Operated: 35 ft power cord. • 780 RPM - 800,000 bristlecounter rotating brushes. • DP 340: 1.1 gallon solution tabk, .75 gallon receovery tank. DP 420: 1.6 gallon solution tank, 1 gallon receovery tank. • Optional Accessories: Carpet, aggressive cleaning and a delicate brush options. Escalator cleaner adaption. •	New machine warranty: Call for details. Looking for Nacecare Duplex DP420 or DP340 Parts?